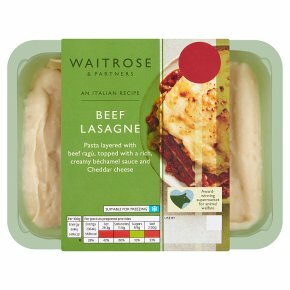 Free range egg pasta layered with beef, topped with a rich creamy bechamel sauce and Cheddar cheese. INGREDIENTS: beef (25%), cooked free range egg pasta (water, durum wheat semolina, pasteurised free range egg, pasteurised free range egg albumen), passata, milk, red wine, onion, tomato purée, carrot, water, tomatoes, mature Cheddar cheese (milk), cornflour, wheat flour, fortified wheat flour (wheat flour, calcium carbonate, iron, niacin, thiamin), celery, rapeseed oil, single cream (milk), garlic purée, salt, basil, beef extract, sugar, yeast extract, oregano, ground black pepper, ground nutmeg, ground white pepper,. For best results oven heat. Do not reheat once cooled.